The EBA 280, Hettich’s new, high-performance clinical centrifuge, offers versatility, convenience, and safety within a compact, elegant frame. Though smaller than a standard toaster oven, the EBA 280 maximizes its dimensions to fit 90° swing-out rotors for flat separation. Hettich rotors for the EBA 280 fit all standard blood tubes, pediatric tubes, and KOVA tubes and feature the Hettich Quick-Lift Rotor System for easy installation and added safety. The EBA 280 is ideal for serology, blood, urinalysis, and pediatric testing. The higher performance version, the EBA 280 S, delivers flat separation STAT, coag. and PPP in minutes. 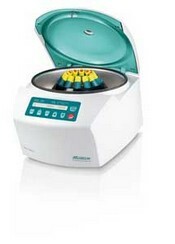 With its impressive versatility, compactness, and performance, the EBA 280 sets a new standard for tabletop clinical centrifugation.